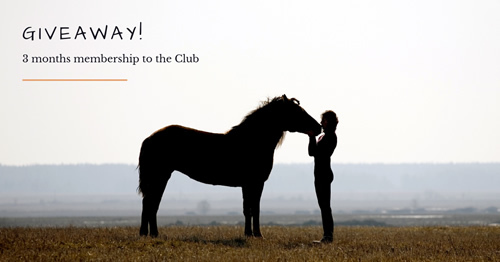 We are busy creating a new online Club full of fun and interesting (non-riding) activities for you and your horse that will make you both very happy. Activities that focus on building communication, trust and the bond between you and your horse. THIS GIVEAWAY IS NOW FINISHED AND A WINNER HAS BEEN CHOSEN BUT IF YOU WOULD LIKE TO VOTE FOR A NAME AND BE NOTIFIED WHEN THE CLUB IS OPEN FOR MEMBERS PLEASE ADD YOUR EMAIL ADDRESS TO THE FORM BELOW. PRIVACY: Your answers on this survey are completely confidential.